Rain, rain, go away. Come back another day! This short song is sung by some who want to be outside playing. For people in other places in the world, rain is to be celebrated and collected. Rain is actually moisture that collects or condenses on particles and bumps into other drops forming ice crystals or drops. Water drops are held up by air until they condense or collect. Drizzle is water droplets small enough not to splash when hitting a puddle. Rain drops are larger, becoming too heavy to be held up in the air, hitting the ground with a splash! Clouds can hold millions of water drops. As raindrops fall from clouds, they join with other drops. 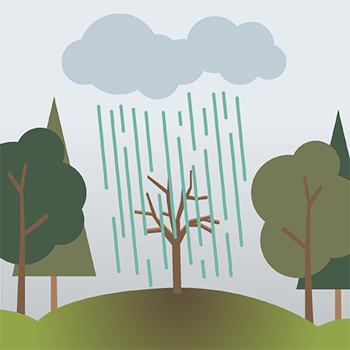 When atmospheric pollution contaminates and acidifies rainfall, the result is acid rain. 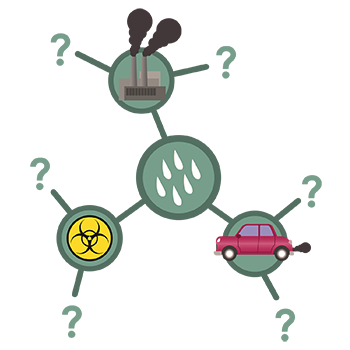 This polluted precipitation causes harm to the environment, especially over forests and bodies of water. Make a diagram of the water cycle with one half of the diagram showing healthy rain nourishing plants, refilling underground aquifers, and using natural vegetation, wetlands, and rocks, sand, and soil to filter ground water. On the other half of the poster, draw a water cycle with precipitation that encounters volcanic explosions, factories, fossil fuel burning power stations, cars and trucks and large machinery in quarries, etc. Draw and note the consequences of acid rain on the water quality. Now that you now the physical sources of acid rain, dig deeper into the actual substances that cause healthy rain to become acidic. Think carbon monoxide, carbon dioxide, chlorofluorocarbons (CFCs), lead, sulfur dioxide, and other hazardous air pollutants and particulate matter (PM). Draw a mind map that shows pollutants. Start with acid rain in the center, then branch out in to the causes of acid rain (factories, fossil fuels, etc. ), and finally what pollutants these sources are putting into the air. Healthy rain is clean rain that has not encountered chemicals and pollutants in its fall from the sky to the ground. It brings water that can be collected and used. It has a slightly acidic pH level between 5.0 and 5.5. 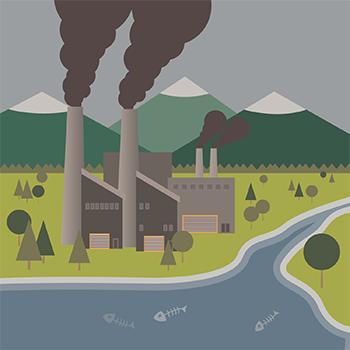 Pollution in the air can contaminate water droplets and make them more acidic, which means that they have a higher number of hydrogen ions than clean water. 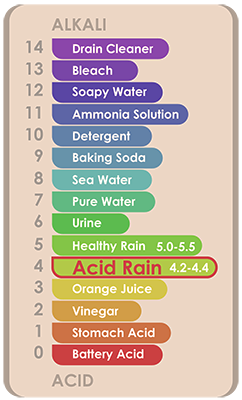 As a result, acid rain generally has a pH level between 4.2 and 4.4. Using litmus pH strips, test the acidity of rainfall. The paper changes color when exposed to liquid based on the liquid’s pH level. Compare your results to the normal pH level for rainfall. Then try testing tap water and compare those results, too! Make a series of word posters with a team of your friends asking the government to protect the future of our earth, air and water. Get creative—try to think of ways to convince your viewers and make your message stick! 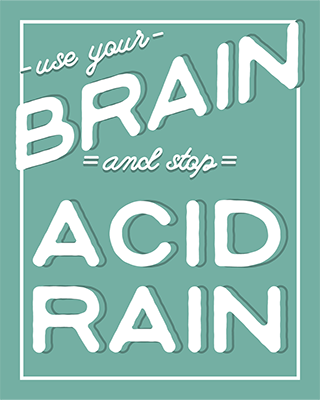 Catchy slogans can be memorable, and focusing on the emotional impact of acid rain can really bring it home. Which of the following pH levels matches acid rain? Which is not an air pollutant that contributes to acid rain? Raindrops are water that condenses around dust particles. ESSEA Water Vapor Feedback or Forcing? What is Acid Rain EPA? Where in the World Does it Rain?